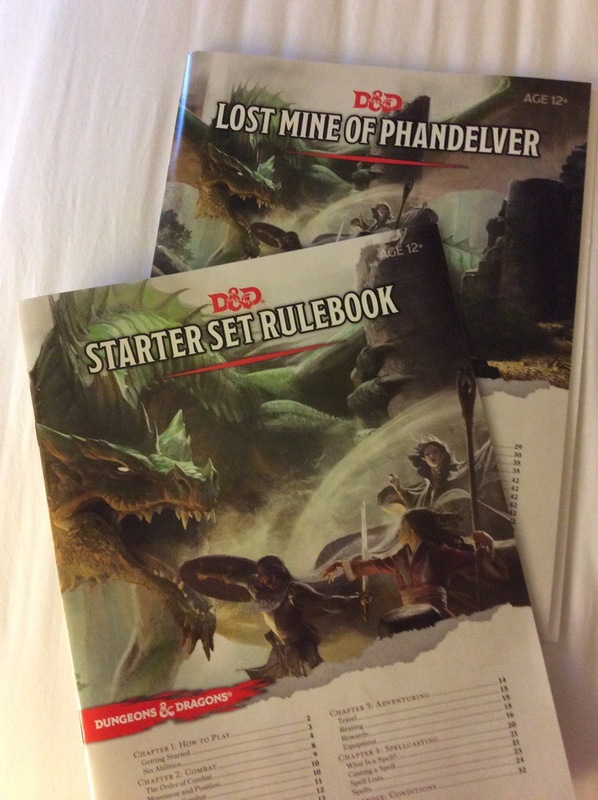 I started digging into my delicious Starter Set this morning. This has been sitting in my flight bag for a day or two. Time to get started (har har) with 5th ed! I’m reading through and noting what sticks out to me based on my 4th edition experiences. When I notice what seems like a change, someone may say, “Well in 4th edition DMG page 125 the same sort of rule is clearly written there.” If that’s the case, great, chalk it up to inattention to detail. But this is just my first-read experience and captures what catches my eye. Chapter 1: How to Play gives you the standard explanation of “What is D&D?” It covers the basics about checks, and how abilities, skills, proficiencies, and saving throws all come into play when rolling dice to determine an outcome. The skills seemed like a decent set. Nothing seemed missing. Some (Bluff, Diplomacy) are refined and given names and examples with wider applications (Deception, Persuasion). I like Investigation as a concept – putting together the pieces and clues, gathering intel of a sort. It seemed like that always fell under Perception in 4th ed, which is kind of dumb. Perception sees things that might be otherwise easy to miss. Investigation sees things and figures out the details that others might miss. To use examples from the book, Perception sees the orcs hiding in ambush along the road. Investigation sees the wounds dealt to the ambush victims and figures out it was probably a band of orcs. Animal Handling always makes me chuckle. It has uses, I’m sure, but I can’t stop picturing a pink-haired Druid character named Fluttershy. I have advantage. I roll two dice and take the better number. Simple. Done. I can see some potential flaws, though. For example if you’re fighting some monsters in darkness, does it turn into a bunch of flailing around? I imagine everyone would get a lot of low rolls. Then again, if everyone shares the same disadvantage, maybe it’s prudent to eliminate that from the equation and only take other disadvantages into account. I didn’t see that stated explicitly, so I imagine that might be my first house rule to reduce rolling and wasted time. Chapter 2: Combat contains one noteworthy difference from 4E: language involving maps and squares doesn’t appear in the rulebook. Maybe that’s an “advanced” option they’ll incorporate later (because I’m sure Wizards of the Coast wants to sell us some map packs and such), or maybe they know that describing everything in # feet gives the DM and players enough to effectively utilize maps. But this does inherently free up groups to use things like simple description or generic drawings on whiteboards or paper to run combat without counting out squares or laying down rulers for line of sight determinations. Could you do that in 4E? Sure, but it seemed pretty obvious that wasn’t what they were pushing for. Now tiles, maps, and minis are an available option instead of the default. First off, the Combat chapter lists available actions you can take on your turn. Everyone can take a move and an action. I’m liking some of the updated choices: You can take a Disengage action to avoid provoking opportunity attacks when you move; you can take a Dodge action to give attackers a disadvantage against you (as well as permit Dex saving throws with advantage); you can Help another creature in completing a task, meaning you give them an advantage to do the stated thing so long as they attempt it before the start of your next turn. Opportunity attacks count as a “reaction” – and you only get one reaction per turn. So there’s no more taking five opportunity attacks in a turn as I’ve seen sometimes argued in 4th edition. Also, everybody gets critical hits on a roll of 20, and everyone misses on a 1. Sauce for the goose (player characters) is sauce for the gander (monsters). And crits look decidedly deadly… deadlier I suppose is the correct term. Instead of max damage for the base attack, you roll any damage die twice and add it all together. So a rogue with Sneak Attack rolls those dice twice too. A glance at the character sheet for the pre-made rogue tells me at level 5, they roll 3d6 for Sneak Attack. Let’s assume 1d4 for a dagger, 3d6 for a sneak attack. A successful crit sneak attack nets you 2d4 plus a whopping 6d6 damage just from dice rolls with no other modifiers? Egad. Rogue carves the Kobold for infinity damage, exploding it like a blood sausage.